Time did pick up speed as I entered the clueless teens and then my botched up youth. Before long I was racing from class to class, cities to cities, people to people, emotions to emotions, passions to passions, blissfully oblivious of the journey’s end. It was not till the last year of my post graduation course that I grew vaguely aware of fleetingness of time, the first faint realisation that it was a journey down not up, and the silken tresses I was sliding down had a terminal point after all, beyond which there was nothing but one grand nada. I will be a fool however if I try to clamber back to the days gone by, claw into the void of what was my younger self, crib at the friends who have parted ways, long for the touch of the departed parent, moon for the haunts that have turned into faceless structures. As the breeze has turned into wild winds and the wild winds into tempests, I have found myself more among withered foliage than blooming buds. And yet, today’s flowers are tomorrow’s flotsam, and yesterday’s flotsam is today’s remembrance, and what is life but a collection of recollections and dreams! Folks, I take this occasion to thank the amazing bloggers who chose to by my friends and thus enrich my existence: Ian Cochrane, the writer who can write in the past and present simultaneously, fusing history with geography and bringing time to a standstill, blogs at People and Places; Marty, the master of aphorisms that can clean bowl you as they collect the wisdom of an eternity and put on your palm, writes at Aphorism of the Day; Kris Landt, the shrink who can anesthetize the reader with her stories and diagnosis writes at Channeling Hippocrates; Subroto Pant, who writes exquisite stories that carry the readers away at Blogs Away; Karthik L, a connoisseur of fiction and fantasy writes at Three Realms of the Mind; John Hartnett, whose humour will equip you with a new vision of the world that Google Glass can’t even dream of, expounds his conundrums at The Monkey Bellhop; Suresh C takes satire and jesting to new heights at Life is Like This; Madilyn Benrubi, whose lyre sings at lesser intervals but regales the sagging spirits every time it does that at JerseyLil’s 2 Cents. I also take the opportunity to thank my erstwhile friends, who have molted out to being celebrities, for not burdening my conscience any more. Congrats to the twins and to their father! Stay blessed! What a great year it has been for you and your blog. It’s a great feeling after you’ve put so much work into writing that others enjoy what you have written. You have a wonderful way with words and an ability to leave the reader wanting more. You must be feeling so proud of your children right now too. And you might just get to see them in the Olympics one day soon as time does fly quickly these days. Blink too long and they’ll be married with children of their own. Have a wonderful festive season Umashankar, and I wish you and all your loved ones a bright and Happy New Year. RPD, I owe the bouquets to my readers and friends who keep buttressing my meagre muse. Thank you for those kind words and the blessings. May the stars keep shining brighter and brighter in your paths for years to come! Uma, you have such a wonderful sense of the pathos of life and the rhythms of time. That’s what makes your writing so moving and memorable. Such a deep understanding of what it means to be human. There is tenderness and humility in everything you write. Wishing you and your family much joy and success in the seasons ahead. Marty, I am glad you approve of my reflections, it reassures me so of my thoughts. Thanks for the kind words and blessings; wish a happy and joyous new year to you and your loved ones too. Nice reflection, USP. So true – even I used to be in such a hurry to grow up – not at all excited about the idea anymore. Other than journey towards the ultimate destination, professionally every passing year raises the bar in competitive corporate life making things tougher. Congrats on the momentous year for yourself and your family. Wish you an even better year ahead. Last but not the least, so glad to see myself be named among your close friends. Karthik, I guess those are common experiences among humans. By the time we realise the tricks time (and life) can play upon us we are in the middle of the vortex. I feel honoured to be able to count you among those who have become friends and co-travellers in the blogging world of late. I wish the best and the brightest for the New Year to you and your loved ones. A wonderful reflection on time and gratitude. “More among withered foliage than blooming buds” – I’m now a gnarled old tree, and much more interesting (and beautiful) than a young straight sapling! Thanks for the posting. I get the message, Bruce, and the light of autumnal grace. Many thanks to you. Romantic, enigmatic & nostalgic prose; with more than a hint of that now familiar magic. The compliments of all folks’ seasons to you. Cheers & thank you US. I am glad it appealed to you, Ian Thanks for the continued support. Season’s Greetings! Experiences that all of us have probably gone through but none can capture it as effectively as you, Uma! And it warms me to see that I have such a place in your heart and in such scintillating company too. Every flute’s strains are different, Suresh, they fall differently on different ears. I consider myself fortunate to be appealing to yours. I have merely described what I feel. That line is the reason why I keep returning to your blog, for I am that noonday fly who feasts upon those delights of your blog. I am humbled to be included in your list and delighted to have you as a reader on my blog. You are a writer’s writer and when your book comes out I’ll be standing in the queue to get my copy. The honour is mine, Subroto. As for the book, you leave me both speechless and listless! Season’s Greetings. It’s amazing how time seems to go so slow when we are young then — ZOOM! — we get older and it speeds up. I’m glad your kids hada great year. Here’s to another one coming up. Janene. it appears to be a common phenomenon by all accounts. Many Thanks for the blessing. Greetings of the season. Many thanks to you for your kind words, Bharti. “Today’s flowers are tomorrow’s flotsam, and today’s flotsam is tomorrow’s remembrance, and what is life but a collection of recollections and dreams!” So true and yet, so difficult to embrace for most of us. Your lines show the wisdom of age and the knowledge that comes through experiences. Very nicely penned US ! Chili Davis has said, ‘Growing old is mandatory – growing up Is optional’ -I am not sure about my progress on the latter. But I am glad you liked that sentence, Ash. Wishing a joyous, serene and silken new year to you and your loved ones. Congrats 🙂 Keep writing and keep inspiring all of us. I’ve not been a regular reader of your blog but this post has summed up all the experiences in this year. Good luck. Happy to have humoured you Ashwini. Season’s greetings to you! 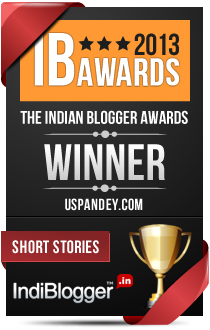 Congratulations – the blogging community recognizes quality! That is so reassuring, Jadi. Thank you. Excellent post! The stunning beginning’s description of time passing–“…a river of molasses where I’d twiddle my thumbs like a noonday fly…”–is beautiful. Isn’t that true, Marylin? Many thanks for your kind words. What a beautiful way to express the sentiments about those good old days. We might not have much and many in terms of material things still we tasted,loved and relished every emotions in our simple ,lovely ” bachpan ke din”. How I yarn for that innocent happiness…..
Congrats…and I know dotty winning that title and prize makes us far more happy than our own achievements. Namita, I guess we had simpler childhoods. Somehow I find today’s children much more complex. Many thanks for the lovely comment.